The Dodge 5.7L and 6.1L EFI Hemi engines are the perfect platform for nitrous injection upgrades. The ZEX nitrous system for the new Dodge Hemi Challenger was extensively engineered for a simple plug and play installation and includes custom-designed brackets and a special fuel line adapter that helps you finish the installation in only 2-3 hours. For the ultimate in engine safety, the ZEX kit uses an advanced safety technology called Active Fuel Control. 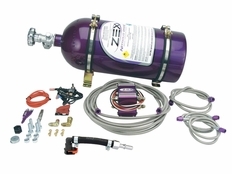 This exclusive ZEX technology monitors the nitrous bottle pressure and adjusts the kit�s fuel enrichment so you are never too rich or too lean. The ZEX patented electronic TPS switch is another example of safe engineering. A ZEX exclusive, the throttle position activation feature engages the nitrous only at wide-open throttle using your accelerator pedal. This technology not only makes it easy for you to activate the nitrous, but it is fully compatible with the Challenger�s throttle-by-wire engine. The part number for this item is 82322 and it fits 2009-2011 Dodge Challenger 5.7 and 6.1 V8 motors.